Fun, easy project. All that you have to do is connect two soda bottles with the Tornado Tube and see vortex energy in action. Watch your vortex spin in the bottle. Cyclone tube will be chosen randomly from 3 translucent colors (green, blue and red). You are buying just the cyclone tube with the direction sheet. This is a great educational and fun experiment and activity for school classes, homeschoolers, scouts and any other group. 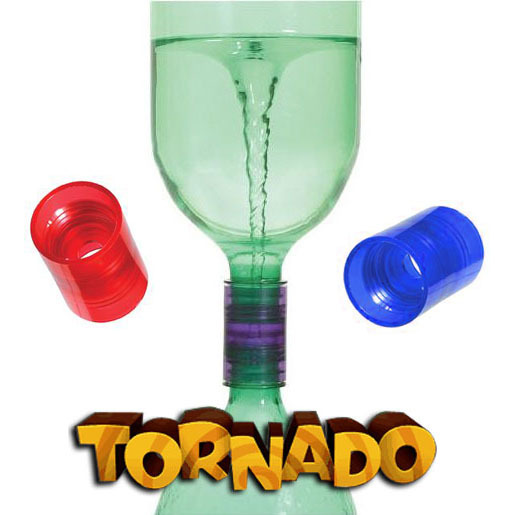 Create a tornado from two 2 liter plastic bottles, water and a colorful plastic connecting tube. Swirling water creates a funnel-shaped vortex as it drains from one bottle to another. You can create different ways to work with it by timing the water draining, using bits of paper or food coloring or lamp oil.